“Solo: A Star Wars Story” is on track for a $114 million four-day Memorial Day weekend opening, which, based on previous projections, is a disappointment. Current estimates have the latest “Star Wars” making $35.8 million on Friday from 4,381 screens. That includes $14.1 million from Thursday previews, the best ever for a Memorial Day weekend release. By Memorial Day standards, “Solo” is doing quite well. If this projection were to hold, Ron Howard’s space heist would be sitting around the $117 million four-day start made five years ago by “Fast & Furious 6” and have one of the top five best opening weekends for a Memorial Day release. Also Read: 'Solo: A Star Wars Story' - Did You Catch Han's 'Back to the Future' Reference? But by “Star Wars” standards, “Solo” is not performing up to past installments. A four-day result of $115 million would be 25 percent down from the $155 million three-day opening made by the last “Star Wars” anthology film, “Rogue One,” which was released in December 2016. While a lower opening was expected, as this is the first Disney-released “Star Wars” film opening in the summer, it’s still below Disney’s pre-weekend projections of a $130 million launch. In fact, it would also be lower than the three-day start for the last “Star Wars” film to open in May, “Revenge of the Sith,” which hit theaters on a Thursday in May 2005 and made $124 million in three days. And there’s also the fact that the bar for profitability for this film is higher than other Lucasfilm projects, thanks to the film’s much publicized mid-production director swap and subsequent reshoots. 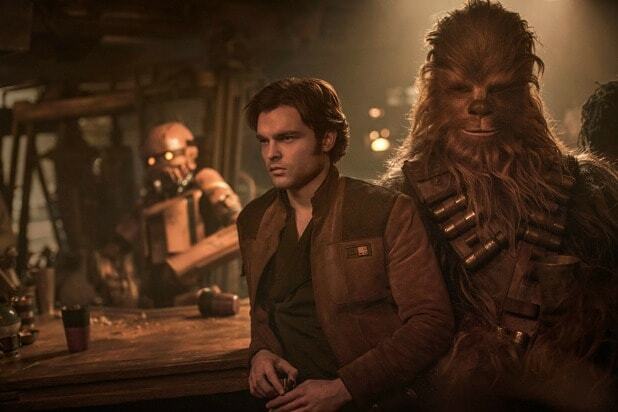 With a reported budget of over $250 million before marketing, it’s not looking like “Solo” will immediately make its money back the way the last three “Star Wars” installments have done during the holiday season. The small bit of hope for this film? Opening night crowds loved it, giving it an A- on CinemaScore. If “Solo” manages to bring its receipts back to projected levels over the course of the weekend, it will likely come from the word-of-mouth given by those early viewers. Critics were fairly positive in their reviews with a 71 percent Rotten Tomatoes score, the consensus being that it’s a fun space adventure. More moviegoers might turn out if they hear similar appraisal from the first round of audiences… or if they hear about the surprise return of a certain character from the series’ past. Outside the galaxy far, far away, “Deadpool 2” is looking like it will have a very good second weekend. The R-rated Marvel sequel is looking at a four-day total of $55-57 million, which would put its domestic total at a very solid $220 million. That would put its running domestic total just 9 percent behind the pace set by the first “Deadpool” two years ago. “Avengers: Infinity War” will take third with an estimated $20-22 million over the extended weekend, pushing its domestic total to above $625 million as it draws closer and closer to the $2 billion mark. In fourth is Paramount’s “Book Club,” which is estimated to make $12.5 million this weekend, down just a tick from its $13.5 million opening. ‘Solo: A Star Wars Story’ – Did You Catch Han’s ‘Back to the Future’ Reference?